This article contains the stats, strategy, and guide for Archer - Ishtar. We will update this as soon as the game comes out. 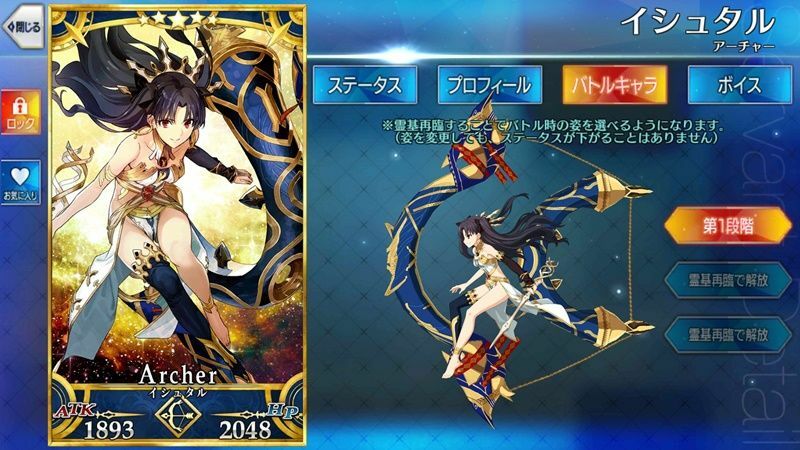 This article contains information about the Archer class servant Ishtar in Fate Grand Order [FGO]. Goddess’ Essence B Increases own damage by 225 and resistance to debuffs by 22.5%. Manifestation of Beauty B 3 7 Increases party’s attack and Critical damage for 3 turns. 80% Chance to get invulnerability for 1 turn. 80% Chance to get invulnerability piercing for 1 turn. Mana Burst (Gems) A+ 1 5 After 1 turn, increase own attack for 1 turn. Increases one’s own Buster Performance for 1 turn. The Sumerian goddess of love, Ishtar is not the kind of goddess you would like to slight. Ironically, she is also the one who suggested to her father to give Gilgamesh a companion. When she witnessed Gilgamesh increasing in fame, she wished to accompany him. However, Ishtar did bit descend to the lands below. Pleading to the other gods, Ishtar, Shamash and Ea helped her create Enkidu to accompany Gilgamesh through his journey. At one point, Ishtar finally gained the courage to speak to Gilgamesh and asked him to be with her. However, Gilgamesh declined. When he did so, Ishtar flew into a rage. She demanded from her father, Shamash, to make her a bull of Heaven. Despite the consequences, Ishtar still got it. She then sent it to destroy a village where Gilgamesh and Enkidu were staying. Thus, lesson learned: never anger the goddess of love.